If you use my Create-an-itinerary form you can put together a custom program which includes Santorini and any other islands you like, get it tweaked with the help of a reliable travel agency and get a price for it. It's free and it is really helpful in putting together a trip. Working with a good Greek travel agency will save you a lot of worry because they will take care of EVERYTHING. For Hotels in Santorini and Island combinations see Fantasy Travel, Dolphin Hellas Travel or Aegean Thesaurus Travel (all excellent agencies, reliable and English-speaking Staff). These agencies can organize your ferries, flights, transportation from the ports and airports and answer all your questions. They can also organize car-rentals on Santorini. The Volcano View Villas are on the rim of Santorini's famous volcano, with three large swimming pools, restaurant, bar, AC in all rooms and a view so amazing you may never leave the premises. Great rates for a hotel of this quality and highly recommended by everyone who has stayed there. For Honeymooners or people looking for something a little more special the Volcano View VIP Villas are five stylish, individually designed luxury villas, each with its private swimming pool and a balcony with a breath-taking view of the Aegean. Honeymooners! Before you commit to anything (besides each other of course) take a peak at Fantasy's Honeymoon Packages which includes Santorini and Mykonos and/or a 4 day cruise. If you want to stay in a beautiful traditional Cave Villa in Oia check out the Alexander Boutique Hotel. 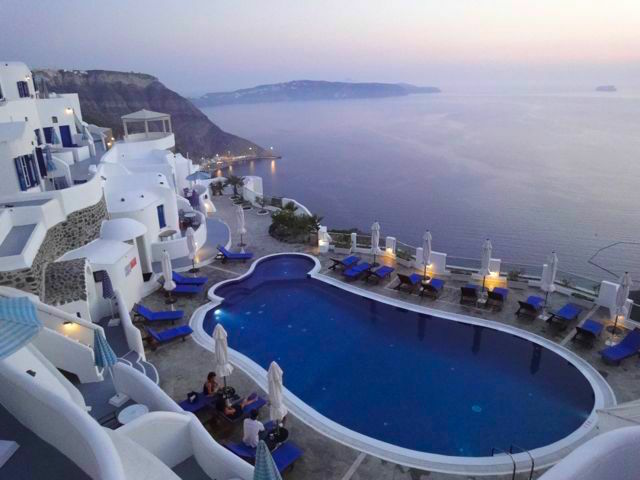 For budget travelers looking for quality in a caldera view hotel try contacting the guys at Aegean Thesaurus Travel and ask them about the Delfini Villas in Oia. Probably the best deal for a budget hotel with a view is the Hotel Ether which is in Oia. A double at the Ether will cost you around 100 euros. For an economical beach hotel check out the Boathouse Hotel on Kamari Beach. Dolphin Hellas has a special at the Villa Kalimera, in quiet Akrotiri. 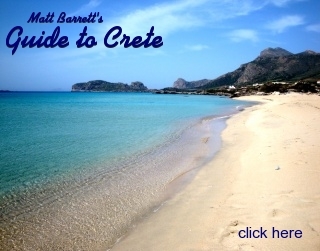 If you are looking for an affordable house to rent on a weekly basis check out Matt's Santorini Villas page which has houses, apartments and self-catering accommodation as well as the kind of stuff you find on Air BnB. 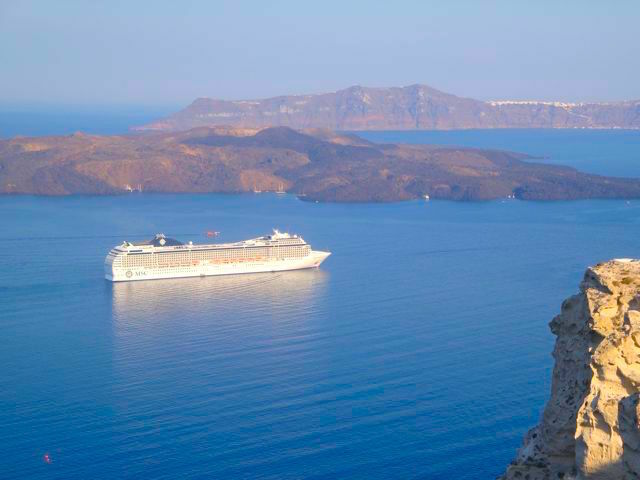 A cruise and spend a few days on Santorini and Mykonos? You can have it both ways. Fantasy Travel's Smart Program #7 allows you to board a cruise ship in Mykonos, sail the islands for 5 days and get off in Santorini and stay there for 3 nights. For Cruises that include Santorini see Fantasy Travel at www.fantasytravelofgreece.com and Dolphin Hellas at www.greecetravel.com/dolphinhellas and click on cruises. Fantasy Travel has designed several vacation programs with a combination of different hotel categories in order to create the best value-for-money itinerary, without compromising on the quality, comfort and all with exquisite views! You can increase or reduce the nights of your stay at some of the destinations. See Fantasy Travel's Special Offers page. Many cruise ship travelers opt for private tours with taxis and buses like rather Dimitris of Ocean Wave Tours who has received many raving reviews from cruise travelers to Santorini instead of taking the tours which are offered by the cruise companies because they can share the cost rather than pay per person. 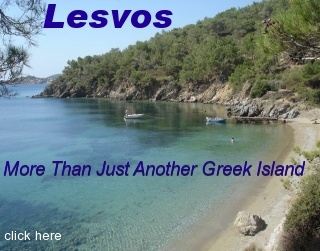 You can also find tours through any Greek travel agency. 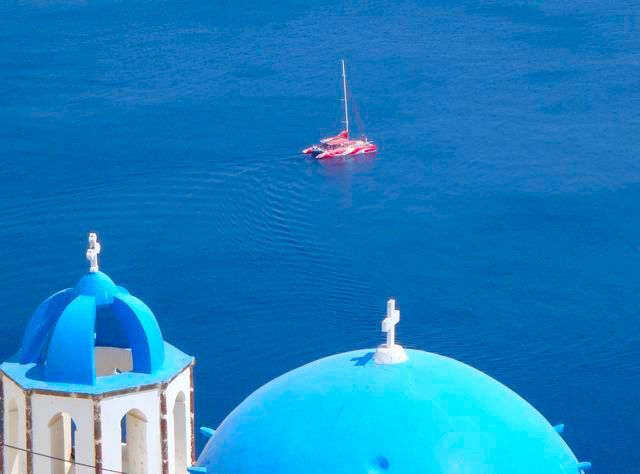 Santorini Today: This monthly info-magazine is free and can be found in many hotels in Santorini. It contains a color map of the island, tourist information, museums, art galleries, important phone numbers (like hospitals, police, emergency road service, port authority, etc), embassies and consulates, transportation, shopping, dining and nightlife. If they don't have it at your hotel ask for it. There is another one available in Athens called Athens Today.